Our first, of monthly, delectable recipes from Jack Rabbit Chocolate Studio is a tried and tested recipe for Salted Caramel. Enjoy making this delicious treat! 1. Heat granulated sugar in a medium nonstick saucepan over medium heat, stirring every now and then as soon as it begins to bubble and melt around the edges. For the first while it will seem as if nothing is happening, but I promise you need to keep watching it. 2. The Sugar will form clumps and eventually begin to melt into a thick brown, liquid as you continue to stir. Be careful not to burn yourself. 3. Once sugar is completely melted, immediately add the butter. Be careful in this step because the caramel will bubble when the butter is added. Continue to stir until it is completely melted and incorporated. 4. Now working quickly and carefully, add the coconut cream/ideal milk while stirring. Allow the mixture to boil for 1 minute. It will rise in the pan as it boils. 5. Remove from heat and stir in 1 teaspoon of salt. Allow to cool down before decanting into a sterilised glass jar. Should your caramel be lumpy, use a stick blender on medium high to work the lumps out, be careful of splashing as this mixture is SUPER HOT! If you prefer a slightly more viscus caramel, simply reduce the amount of coconut cream. And add more should you like it more runny. Store bought Madagascan vanilla ice cream slightly softened. Roast slivered almonds with some honey, allow to cool and chop up and mix in with ice cream. Top with salted caramel sauce. Cover the pastry flan with tempered chocolate and place in the refrigerator, this will make sure the caramel doesn’t make the pastry soggy. Put a layer of salted caramel sauce in the bottom of the pastry flan. Refrigerate for an hour or so till the caramel has a layer of skin or is firmish to the touch. Prepare chocolate genache with your favourite chocolate and cool slightly before pouring carefully over the salted caramel layer. Refrigerate for approximately an hour and decorate with either raspberries, cocoa powder, salt flakes or some Gold leaf. Temper chocolate and line easter Egg moulds. Prepare salted caramel, let cool and fill a large pastry bag with the caramel. Snip the front of the pastry bag and fill the cavity with salted caramel sauce. Allow to set slightly. Be careful not to overfill the cavity as you still have to top it with chocolate. 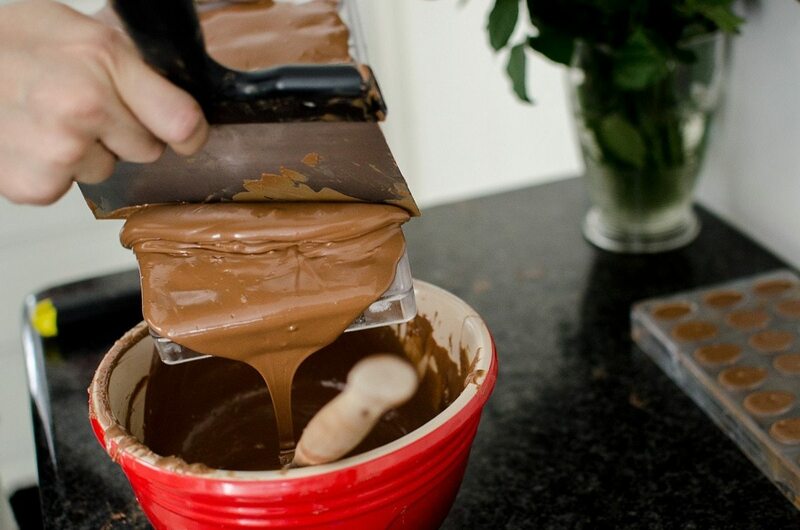 Close the cavity with chocolate and smooth out with a spatula. Decorated with luster, or with coloured white chocolate. 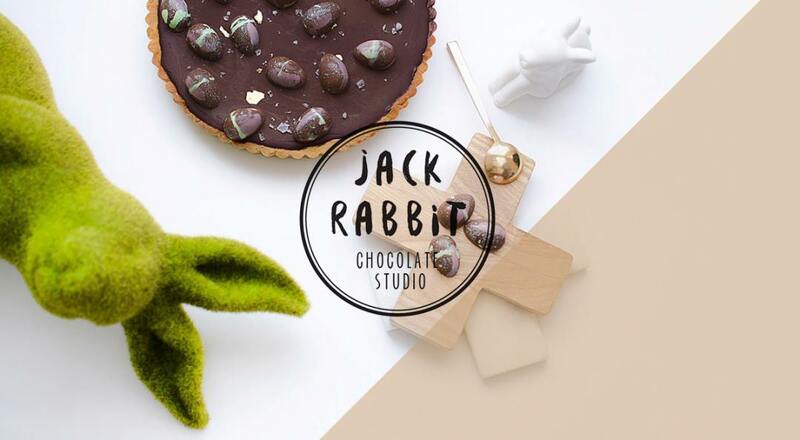 Jack Rabbit Chocolate Studio offers artisanal hand made chocolates and confections unique to the South african Chocolate market. Their approach is exciting and different, offering customers and guests to their studio a luxury gifting experience as well as mind blowing chocolates. Visit them online, or follow them on Facebook and Instagram for more. Photos by Rita Lubbe. Jack Rabbit Chocolate Studio offers artisanal hand made chocolates and confections unique to the South african Chocolate market. Their approach is exciting and different, offering customers and guests to their studio a luxury gifting experience as well as mind blowing chocolates.